Using a vegetable peeler or spiral slicer, cut the zucchini lengthwise into long, thin strands or strips. Place the zucchini noodles (zoodles) in a colander and toss with 1 teaspoon salt. Allow the moisture to drain from the zoodles for about 20-30 minutes. Place the drained zoodles on a plate lined with clean paper towels and gently press with more towels on top to extract the remaining moisture. Set aside. In a 2 cup capacity measuring cup, combine the vegetable broth, wine and arrowroot or cornstarch. Whisk until blended and set aside. Heat a large non-stick skillet over medium heat. Add the butter and 1 tablespoon of the olive oil. Sauté the shallots and garlic for about 1 minute then add the shrimp, oregano and a dash of salt. Cook for 1 minute turning the shrimp once then stir in the wine mixture. Cook for 2-3 minutes until the mixture thickens and the shrimp is cooked through. Remove the pan from the heat and add the lemon juice and capers. Pour the shrimp into a serving bowl and set aside. Wipe out the skillet and add the remaining 1 tablespoon olive oil. Add the zucchini noodles and gently toss until they are hot, about 3 minutes. 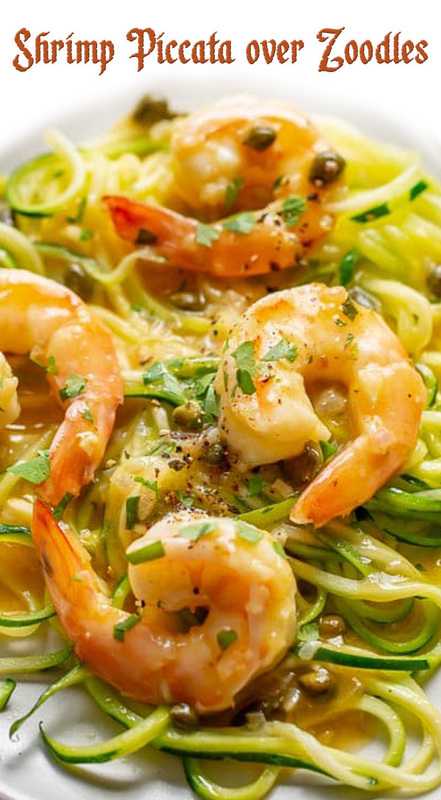 Toss the hot zoodles with the shrimp mixture. Serve garnished with freshly ground black pepper, salt to taste and chopped fresh parsley.